Ian Poulter has been said to be “living the dream” by various Golf publications, and they’d be right in doing so. Here we see the English PGA pro proudly showing off his white Ferraris. 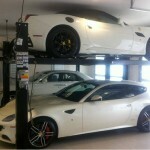 In the background is his California with black rims and yellow callipers and in the foreground his Ferrari FF. The two time World Golf Champion has recently shown his passion for the Italian company by purchasing a LaFerrari – as soon as we see some pictures of them together, you’ll be the first to know.